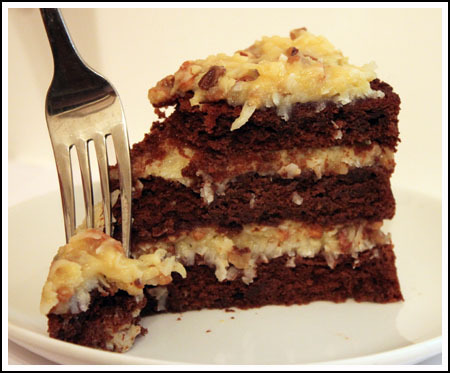 Thanks to all who have suggested German chocolate cake recipes. I’m putting together a list so we’ll have them in one place. The German chocolate cake from earlier this week was fabulous, despite having to strain the scrambled egg from the icing. A few people have mentioned Trisha Yearwood’s German chocolate cake was their go-to recipe. Looks good. Bobby Flay’s German chocolate cake with cajeta got some votes, though I’d have to make it without the goat milk. And one reader suggested Trish Boyle’s German chocolate cake from Diner Desserts — a book I just put on my Christmas list. Luckily, the recipe is on-line. And finally, there’s a recipe Sue sent from an old set of Time Life books. I’ve pasted an adapted version below. It’s very close to the traditional version, but with less sugar, more chocolate and a bit of chocolate in the icing. Divide the batter among the three cake pans and bake on middle and lower racks for 35 minutes or until a toothpick inserted in the center comes out with moist crumbs. Cool the cakes for a few minutes and unmold. Remove the parchment, invert cakes back to upright and cool on racks. Whisk together the egg yolks and sugar in a 2 quart saucepan until thick, about 2 minutes. Whisk in the milk, butter, and chocolate. Cook over low heat, stirring constantly until it is smooth and thick enough to lightly coat a spoon, about 5 minutes. Keep heat low or egg yolks will scramble. If this happens, you’ll have to strain. Remove pan from heat and stir in the vanilla, coconut and pecan. Let the frosting cool to room temperature. Then refrigerate until thicken but not quite solid, stirring it couple of times. I think I just gained a few pounds from seeing and reading about this cake! That looks divine and thanks for sharing it! I think the ingredients on the Lee’s Market page look fine. I’d re-write the recipe anyway. Don’t worry. It’s been mentioned multiple times, as has the one from Cooks Illustrated. This list was supposed to be recipes that were very close to the original — specifically, ones that used German’s brand chocolate. But since I have Bobby Flay’s on the list, I should probably add the two mentioned above. I’m surprised no one has mentioned David Lebovitz’ German Chocolate Cake. I made it last week. It’s fantastic!! Super moist!! Wow, a lot of recipes to try. Thanks Anna. My wife loves German chocolate cake. I’m going to have to surprise her by making some of these different recipes. I’m sure she won’t mind.